Late this afternoon, Essex Greenbelt’s Dave Rimmer and my husband Tom observed the Plover family leaving the parking lot and heading toward the dunes. Dave shares that they first appeared to be heading to the beach via the marsh creek end, when they suddenly switched direction and started back in the opposite direction towards Boardwalk #3. They went part way down #3, then back toward the parking lot, then back down #3. The family next began to go through the dunes toward the the middle of the beach, away from the #3 roped off area. After all the zig and zagging, the little family returned to the boardwalk, and then headed straight through the dunes, in the direction of #3 nesting zone. Dave lost sight of the chicks, but could hear the parents urging them on. Out they tumbled, down the dune edge, and into the roped off #3 area! 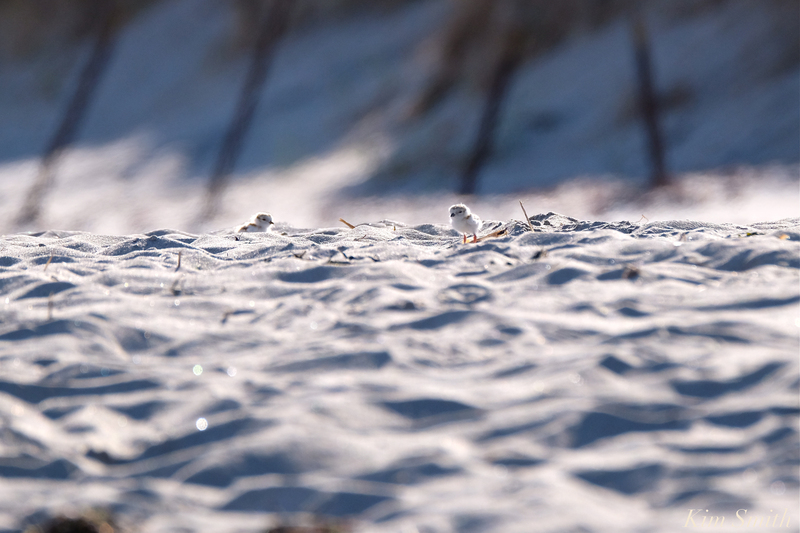 Please keep your eyes peeled for tiny toothpick-legged mini-marshmallow sized chicks zooming around in the sand. We are elated that all four chicks made it safely out of the parking lot. Quite possibly this was the PiPl plan all along. Several times I observed the adults making the overland route at the very same time that they began nesting in the parking lot, which I had not seem them do in the the previous two years that they nested at GHB (in the very same location all three years). The PiPl left the beach due to extreme dog disturbance while trying to court and nest, sadly finding the parking lot to be the quietest and safest place. Yesterday afternoon, we all observed folks trying to bring their dogs through the parking lot and onto the beach, after the life guards had left. The presence of dogs caused extreme alarm by the parents, they would pipe loud warnings and then leave the chicks to try to distract the dog. This is when chicks are at their most vulnerable, when the adults have to leave them to defend against predators. The problem is only going to get worse now that the footbridge has reopened. Please, please to the folks bringing your dogs to the beach after hours, now it is more critical than ever to please leave your pets at home. If any of our readers see a dog on the beach at anytime of day for any reason, first make sure the chicks are safe, and then please don’t hesitate to call the police. 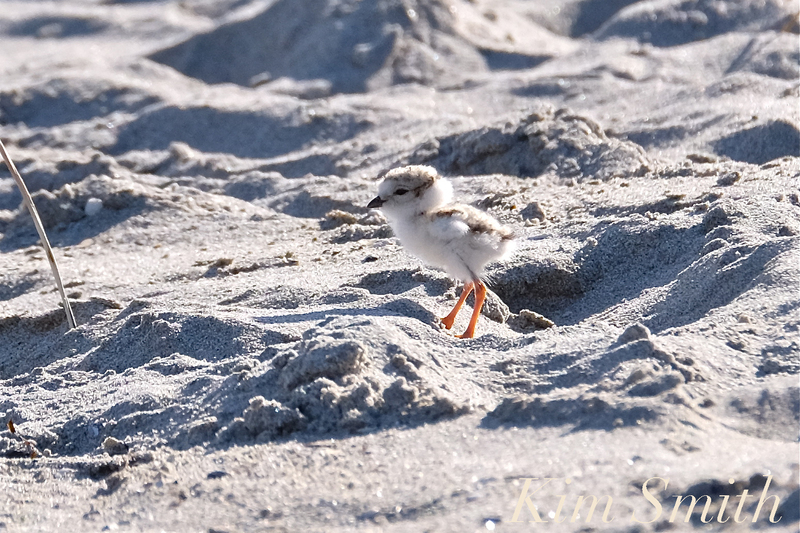 Trash left on the beach is another huge issue for endangered shorebird chicks, of any species. Trash on the beach equals a plethora of seagulls. As do dogs, seagulls cause extreme duress for the PiPl parents. Even though the gulls prefer the easy garbage pickings left behind, they also eat baby chicks. 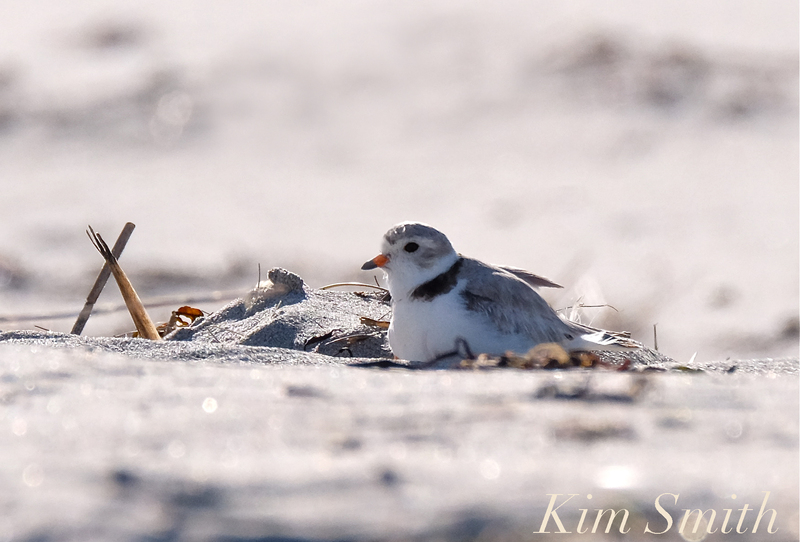 If you would like to be a a volunteer PiPl monitor, please contact kwhittaker@gloucester-ma.gov. Thank you! Both Mama and Papa are now able to tend the chicks, while they are also able to feed and take care of themselves simultaneously keeping within earshot and eyesight of each other. This entry was posted in Birds, Birds of New England, Cape Ann, Cape Ann Wildlife, Gloucester Plover, Good Harbor Beach, Life at the Edge of the Sea, Piping Plover and tagged #SavetheShore, #shorebirdsgoingextinct, Beautiful Birds of Cape Ann, Charadrius melodus, dogs on the beach, garbage, Gloucester Plover, Good Harbor Beach, how you can help the plovers, nest, parking lot plovers, Piping Plover, Piping Plover nest, Piping Plover parking lot nest, Piping Plovers, Seagulls on June 10, 2018 by Kim Smith.